Alisa Weilerstein: The Art Of Chopin's Cello Cellist Alisa Weilerstein was born into a musical family with a love for chamber music. Her passionate performance of Chopin's Cello Sonata at WGBH is the sign of a young musician well on her way to a major career. If Rodney Dangerfield had been a classical music critic, he might have said something like, "Cellists, they don't get no respect." Ever since the 19th century, a "Cult of the Violinist" has prevailed in the public imagination. Whether it was virtuosos like Paganini and Joachim back then or Joshua Bell and Hilary Hahn today, the myth of the devilishly attractive and supernaturally gifted über-violinist has remained a marketing tool that sells. Cellist Alisa Weilerstein is as huge a new talent as any of those mass-marketed newbie violinists we see gracing the covers of CDs. She plays with fire and intense commitment. Her musical sensibilities are honed as sharp as a razor, and she disappears into the world of the music so remarkably that it's a wonder to witness it. You can hear it yourself in this studio session, where she gave us a fresh look into the world of Frederic Chopin. The cello career of Alisa Weilerstein began with a Rice Krispies cereal box. Weilerstein's grandmother cut up the box, painted it to look like a cello and then secured it with an old toothbrush as the end pin. The 2 1/2-year old Alisa loved her toy cello, and when she was 4, she asked for a real one. It wasn't a surprising request, since Alisa's parents are both musicians. Her father, Donald, was the longtime first violinist of the famed Cleveland Quartet, and now a respected violin teacher. Her mother, Vivian, is a noted pianist, and both sit on the faculty of the New England Conservatory of Music in Boston. 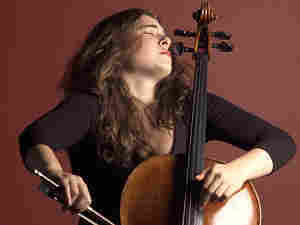 At 13, Alisa made her debut with the Cleveland Orchestra and later formed the Weilerstein Trio with her parents. Now in her mid-20s, Alisa Weilerstein still performs with Mom and Dad, but she has definitely left the nest, playing with the most acclaimed orchestras and conductors, from the New York Philharmonic and San Francisco Symphony to dates at the Lucerne Festival and tours of China and Europe. Frederic Chopin, often dubbed the poet of the piano, wrote very little music that did not spotlight that instrument. Aside from a handful of songs and a piece with flute, only one other instrument seemed to hold Chopin's interest — the cello. In the 1820s and '30s, he wrote three pieces that featured the cello, leading up to a much more substantial masterwork: the Cello Sonata in G minor, Op. 65, from 1845-46. The Cello Sonata was Chopin's last major composition, and it caused him some amount of trouble. "With my sonata for cello and piano," he wrote to his family, "I am now contented, now discontented. I lay it aside, then pick it up again." Chopin may have had troubles deciding which of the two instruments would get the more complex and interesting lines. Chopin dedicated the sonata to his friend, the cellist Auguste Franchomme. Together, the two played three movements of the piece at Chopin's final Paris concert on Feb. 13, 1848, just over a year and a half before the composer died. Listen to the previous Favorite Session, or see our full archive.